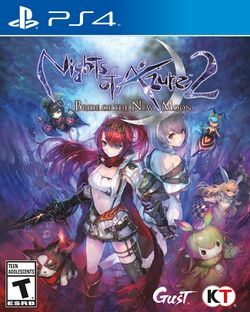 Nights of Azure 2: Bride of the New Moon is an Action RPG developed by Gust and published by Tecmo Koei for the PlayStation 4 and Nintendo Switch. The game was released in Japan on August 31, 2017, in North America on October 24, 2017, and in Europe and Australia on October 27, 2017. The game was also released on the PlayStation Vita in Japan, and on PC in North America. This page was last edited on 20 February 2018, at 06:42.